Come and hear speakers from across the Labour and trade union movement give short speeches at our informal rally – outlining their visions of how a future Labour government can once again play a leading role in the fight against global poverty and injustice. Speakers include: LCID Honorary Vice-Presidents Alison McGovern MP, Shadow DFID Minister, Gail Cartmail, Unite Assistant General Secretary, Lord Jack McConnell, Richard Howitt MEP, Seb Dance MEP, and Stephen Doughty MP; Shadow Defence Secretary Vernon Coaker, Shadow DFID Minister Gavin Shuker MP; Shadow DECC Minister Baroness Bryony Worthington; Simon Franks, Franks Family Foundation; PPCs Mel Ward, Purna Sen and Jess Asato; Labour List Editor Mark Ferguson; and BOND Chief Executive Ben Jackson. The compère for the evening will be our Chair Claire Leigh. In partnership with Bond. Refreshments provided. Meet at St Peter’s Square tram stop, central Manchester, close to the conference centre – contact our chair Claire Leigh or look for a group wearing white LCID t-shirts! Alternatively meet in the constituency at 2pm in Morrisons supermarket car park, Chorlton, next to Chorlton tram stop. Come and listen to Shadow Foreign Secretary Douglas Alexander, Shadow Secretary of State Jim Murphy, and Shadow Secretary of Defence Vernon Coaker outline the next Labour government’s international agenda. Training for PPCs and their campaign teams in how to talk confidently about international development on the doorstep. The session will by hosted by Lord Ray Collins, Labour’s Spokesperson for International Development in the House of Lords, and Kirsty McNeill, former Downing Street adviser and PPC, and founder of strategy consultancy ThembaHQ. Got a footy top you can donate at conference? 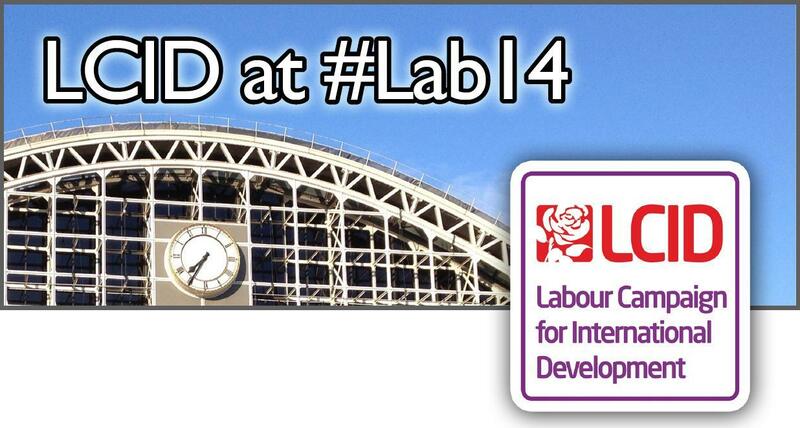 All members and friends of LCID are invited to join us for drinks in the main conference bar. We’d also like to share the events our friends in the charity sector will be putting on about development. For a full listing of these event click here.